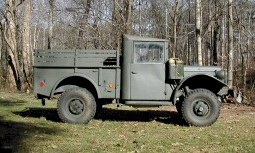 My plan was to get the M37 fixed up just well enough to be usable as a "beater," then to restore the civilian truck. After I had the civilian truck fixed up, I figured I would sell off the M37 and its parts truck to someone else. Plans changed. The more I worked on the M37, the more I liked it. Meanwhile, the civilian Power Wagon had a lot more problems than I had originally noticed during my trip to Alabama, and work on it kept getting postponed. One day, I had a phone call from a guy in Georgia who heard that I had a civilian Power Wagon that might be for sale... Two weeks later, I had parted with the 1950 B2 Power Wagon. Since then, I've been working steadily on the M37. These pages are to show what I have done to the truck, and to share what I am learning along the way. Page concerning Carrying Children in a Pickup Bed in North Carolina and the Seat Belt Law.